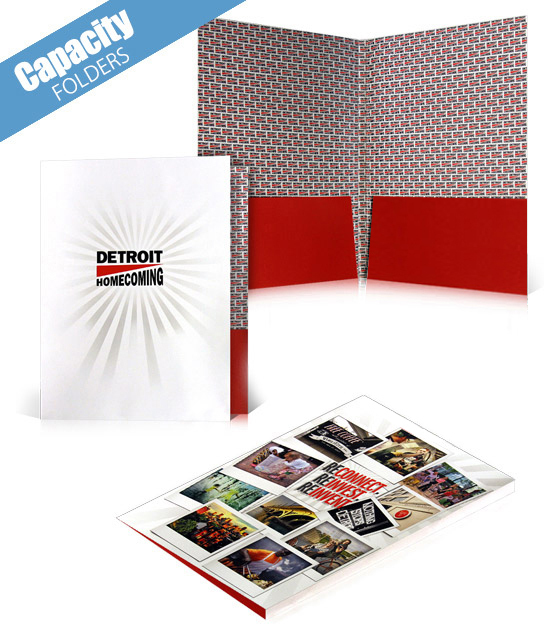 When you need to have more room, Capacity Folders are the way to go! We offer several sizes of pocket options to accommodate most scenarios. The larger capacity pocket allows you to insert booklets, closing documents, annual reports, tax returns, or any thicker insert. We recommend the 3/16" pocket option to hold about 50 sheets of paper and 3/8" pocket to hold about 100 sheets of paper. Choose between 2 different stock thicknesses: 12PT is the most common thickness for a standard folder but 14PT is usually preferred with a capacity folder. The thicker stock will give it a little more rigidity and durability. If you do not see the exact size or capacity you are looking for, feel free to contact one of our folder experts and we will make it custom to your specifications. Our Folder Printing experts are standing by at (866) 936-5337 ready to answer ay questions you may have.